mottled dark and light brown; pale belly and black and green wing speculum. Most common migratory duck. Swift flier and difficult to circumvent. tender shoots and grains; mostly vegetarian. The Common Teal is the smallest and one of the commonest of wintering ducks in our area. 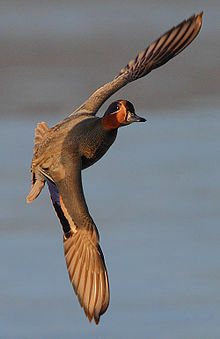 They are one of the earliest ducks to arrive, with birds appearing in August, building up to peak numbers by November. They start leaving in March with stragglers through to May. It breeds mainly on small pools and marshes throughout central and northern Asia as far as the land extends. It also breeds in Europe. Common Teal occur in large flocks of up to 3,000 on the favoured larger wetlands, particularly during the day when they are likely to be roosting. They are mainly both crepuscular and nocturnal feeders, flighting out to favoured areas in the evening and returning to larger water bodies at dawn. Although frequently seen on open water, Teal are often found on small pools and village ponds and are particularly fond of patches of shallow water surrounded by grass and reeds and mudflats. In years of good monsoon they favour flooded fields and thus can be very widespread in our area. They eat mainly aquatic vegetation from the surface and will also feed on open mud among wader flocks. Common Teal are among the fastest flying birds and it can be difficult to get a fix on them as they hurtle past. They are prone to sudden and inexplicable circuits of a site if they are once disturbed. At rest the male has a high-pitched repeated whistle which seems to be a means of keeping parties together in thick cover. They are very gregarious and mix readily with other dabbling duck, particularly on open water.